Wright State university students Chris Buck and Jon Nonnenmacher feed shark-rays at the Newport Aquarium in northern Kentucky. John Nonamaucher has an internship at Newport Aquarium. College internships evoke images of brewing coffee, making copies, and performing other trivial tasks. For interns from Wright State University, not so much. Raiders across the country are participating in exciting internships such as working in Congress, feeding sharks, or helping private eyes track down suspects. Besides the fun-and-fascinating element to these internships, students use them to build career experience, pad their résumés, and give themselves a leg up in a competitive job market. “There is an internship for every student no matter their major or career interest, and they should snap up the opportunity,” says Kim Jungdahl, assistant director of Career Services at Wright State. Internships give students a unique way to promote and market themselves upon graduation, she adds. Wright State student John Nonnenmacher has always been interested in the water and what lives in it. His driving passion is sharks. He records the Discovery Channel’s Shark Week programs religiously. 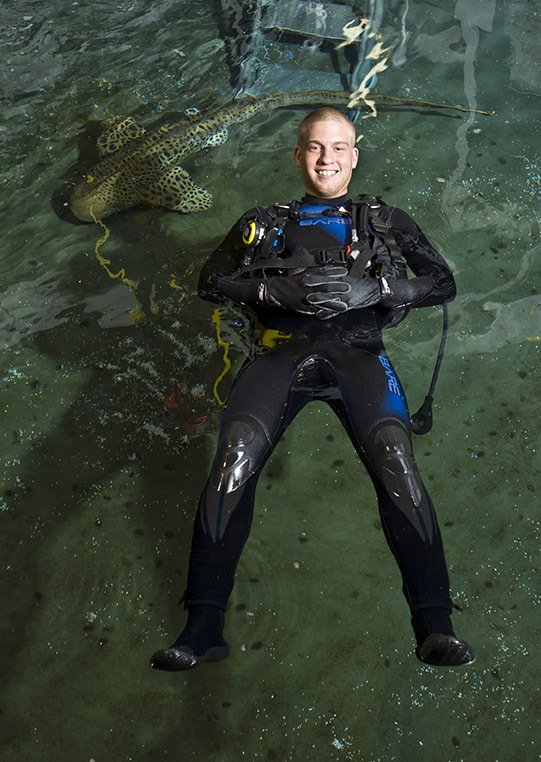 Nonnenmacher followed his aquatic interests into an internship at the Newport Aquarium, where he can be seen in full scuba gear at the bottom of the shark tank, feeding the aquarium’s two shark rays, Sweetpea and Scooter. Nonnenmacher feeds the rest of the sharks, including zebra sharks, nurse sharks, and sand tigers, from above the tank. He said he enjoys his work and believes it is preparing him well for a career in marine biology. Mandy Hooper, a criminal justice major, is another student who feels that her internship has enabled her to advance her career path. During her internship with Stealth Investigations, LLC, Hooper earned her State of Ohio Private Investigator’s License. That license will allow Hooper to operate as a private investigator, tackling head-on all the tasks she assisted with as an intern, such as going through surveillance videos in search of suspects. “My favorite thing was being nosy and looking at all the photographs and the video that [my supervisor] took,” she said. Occasionally, she was able to accompany her supervisor into the field on surveillance assignments. “The best part was actually getting out of the office and watching people,” she said with relish. Now that she has finished her internship and her licensure, Hooper said she’s eager to start work as a P.I. “I’m actually going to go to Career Services so they can help me apply to a whole bunch of different investigative jobs,” she said. A number of Wright State students find internships each year through The Washington Center, a nonprofit educational institution that matches students with internships in Washington, D.C.; London and Oxford, England; and Sydney, Australia. Students work with government agencies, nonprofit organizations, and Fortune 500 companies. During their internship semester, they also take an academic course and attend seminars featuring prominent business leaders, government leaders, and diplomats. Wright State graduate Shashrina Thomas participated in the The Washington Center program as a congressional legislative intern. She worked with former Congressman Louis Stokes, the first African American on the House Appropriations Committee. 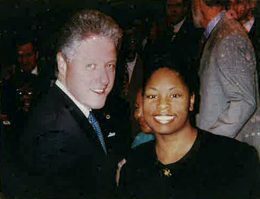 The program helped Thomas launch a career in the federal government. She currently serves as deputy chief of staff to U.S. Representative Sheila Jackson Lee (D-TX). 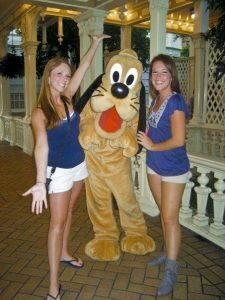 Tiffany Fridley participated in the Disney College Program in 2009. One of the most magical internships available to Wright State students might be the Disney College Program. It provides students with months of working and playing in the Disney Parks, and years of benefits. Disney has high name recognition and rigorous business standards, said Debra Wilburn, the Wright State University liaison for the program since 1998. That has a strong positive impact on potential employers. “They know that if a student succeeded at Disney, then that student can follow through on commitments,” Wilburn said. Tiffany Fridley participated in the Disney College Program in 2009 as an entertainment cast member. She danced in parades, walked on stilts, and brought smiles to the faces of thousands of people.